First I would like to thank the staff at Reef Central for noticing my tank and giving me the opportunity to display it here. 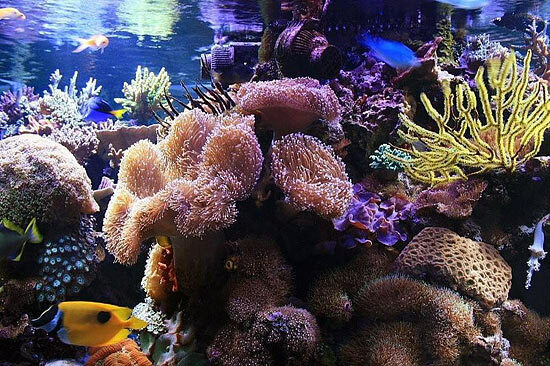 The amazing Reefkeeping Magazine’s TOTMs illustrated in the past have always been an inspiration to me, and to have my aquarium included among their number is an incredible honor. 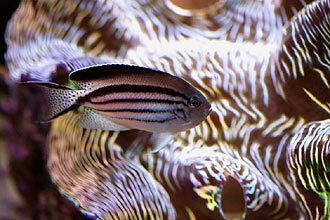 My name is Paul Bruns and I have been an aquarist for over thirty years. My present tank is the culmination of what I have learned in all those years and a testament to how this hobby can be a lifelong passion. My undergraduate degree is in biology, and that field of science has been my main interest since a very early age. Presently, I am a Medical Technologist at an area hospital near my home in Bridgewater, Massachusetts. 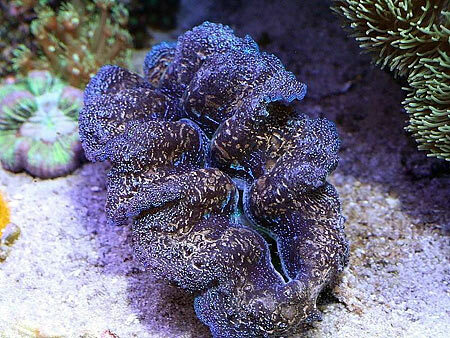 Working in a lab and being familiar with laboratory methods has often helped me with my reef keeping. 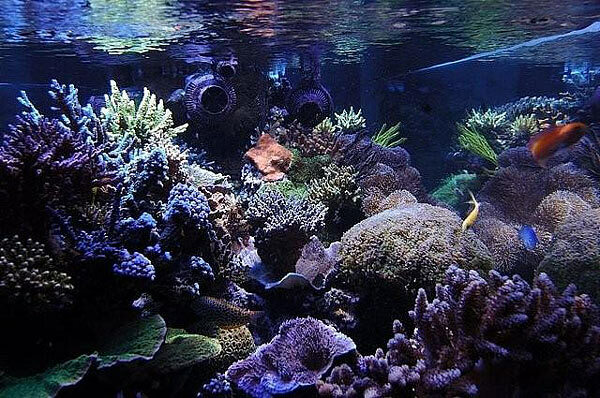 It was years ago however, that the fascination with the biological sciences led me to keeping aquaria when I was a teenager. 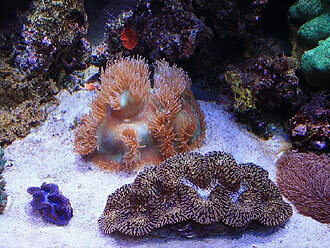 In this write up I will provide the usual specs and info that everyone will be looking for about my aquarium and system. 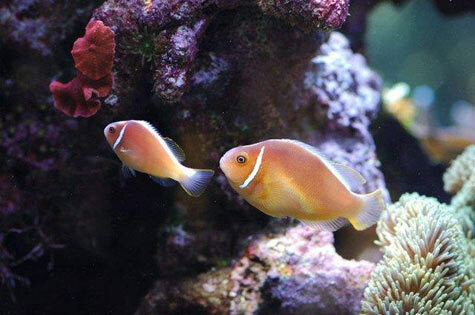 Since the design of aquariums and the rooms they are shown in has been a recent topic of interest on some threads on Reef Central, I will try and point out some of the things I did in that regard. 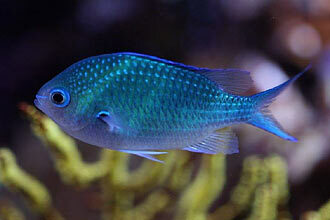 As I mentioned previously, I first started keeping aquaria when I was a teenager. I lived in a small two bedroom ranch with my mother and younger brother. Eventually, my mother granted me the wish of every sixteen year old and managed to give me a room of my own. A three seasons sunroom at the back of the house was converted to a four season bedroom for me and I was in heaven. That room had glass on three sides and a skylight. I filled it with plants and two aquariums, one 75gal freshwater and one 30 gal marine. 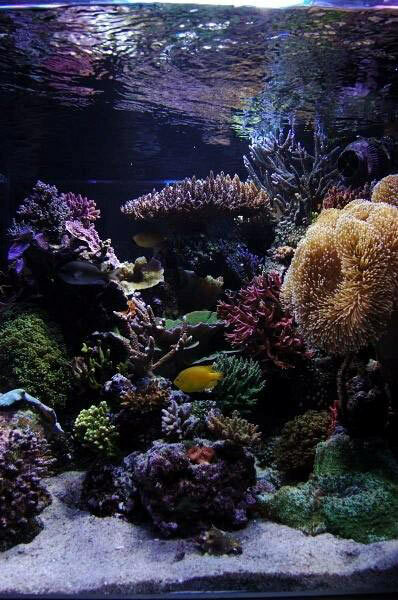 I loved it, and its memory played an important part in the conception and construction of my present aquarium and the room that houses it. 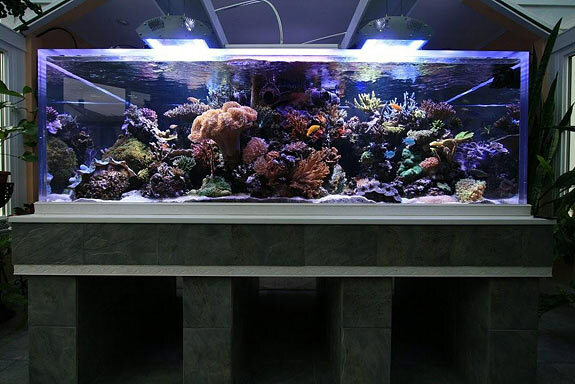 As the years passed I kept a dream of creating an aquarium presented unlike any other I had seen, built in a room that would compliment its unique beauty. 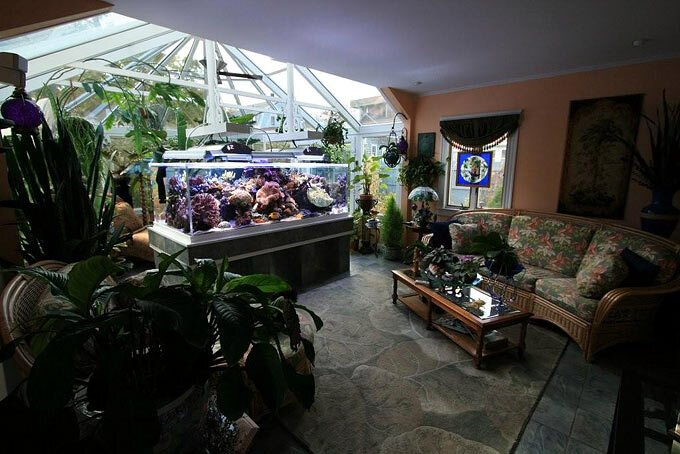 This “dream reef” was to be surrounded with tropical plants, flooded with natural sunlight, and sit as the centerpiece of a four season solarium. I had two different but related sets of goals. 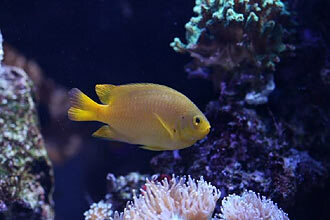 The first was the livestock I would have in the aquarium itself and the technology that would sustain it. The second concerned aesthetics and the design of the tank and room. 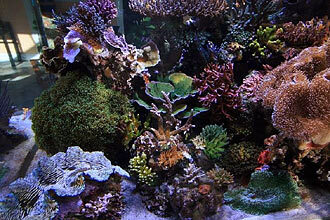 My personal preference in a reef tank is for one that is referred to as "mixed." 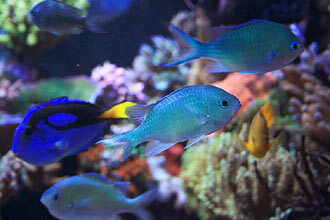 I want the aquarium to display as much biodiversity as I can possibly achieve with it, similar to a reef in nature. This presents obvious challenges. 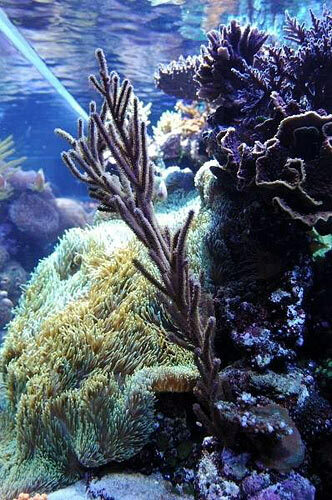 It would require a system that could maintain water quality in the presence of a wide variety of animals, some of which produce proteins and toxins that would inhibit the growth and health of others. Also, the lighting requirements of such a diverse group of organisms would be quite variable, needing a lighting system with a lot of flexibility. In terms of design, I’m not sure how I would categorize what I wanted to achieve. 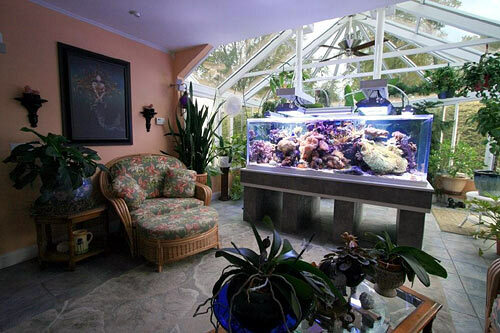 I wanted the reef to be visible from all sides and from every part of the room. It would undoubtedly be its primary feature. The stand, lighting fixtures, everything must look integrated into the whole structure. 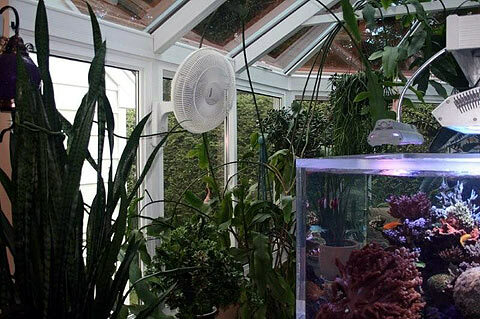 The room, with its high vaulted windows, sunlight and numerous plants would help showcase the tank. The design or style is meant to enhance a feeling of abundant tropical life. To accomplish all of this, I made a to-do list that looked something like this. 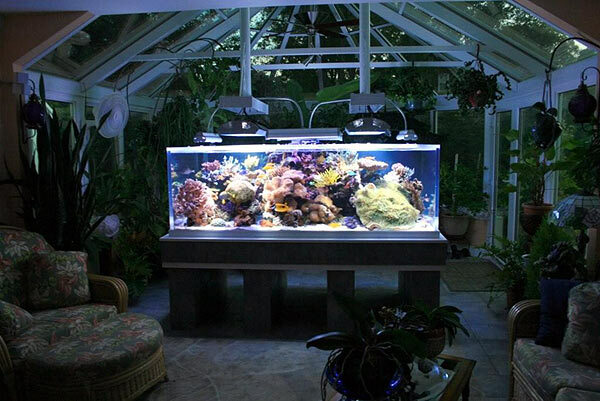 Acquire an open top tank for its visual appeal and ease of access. No hood to cover the top. 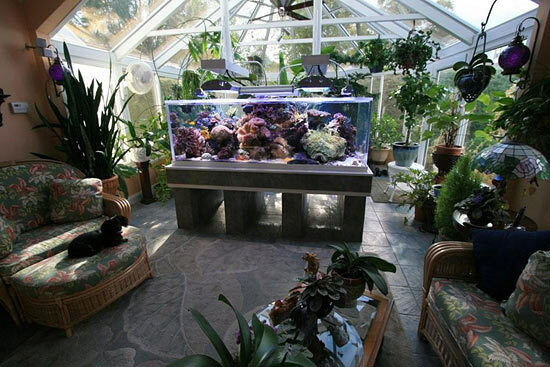 The tank must be easily viewable from all four sides and the top, necessitating a center overflow. The stand should be non-traditional having no cabinet or doors. 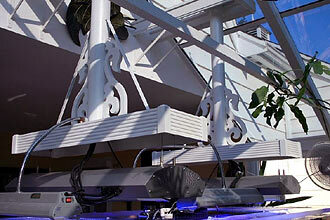 The lighting fixtures need to be suitably designed for flexibility, yet appear to match the solarium structure. All the plumbing and equipment must be concealed in the basement. Ballasts and electrical for the lighting would be located in the utility room above, hidden from view. 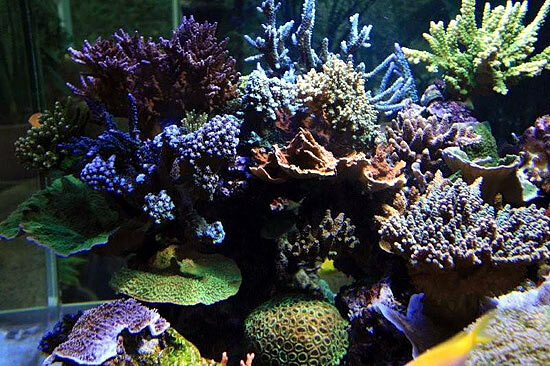 One of the reasons I love this hobby so much is that not only does it address my interest in aquatic life, but it can also satisfy my desire to acquire and play with a wide variety of technical “stuff”. There is also a large variety of side hobbies you can get involved with. A good example of this would be photography. I think everyone reading this knows what I’m talking about. From DIY projects to various kinds of equipment that repeatedly emptied my wallet, I definitely love it ALL. 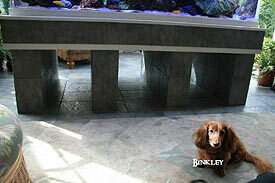 The tank is Euro- braced with an open top, constructed of one inch thick acrylic manufactured by Envision Acrylics. It is 84 inches long by 38 inches wide by 30 inches high (213cm x 96.5cm x76cm). 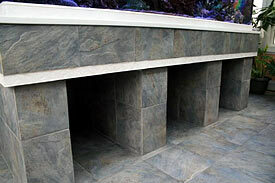 It has a center overflow that is eight inches by twelve inches wide (20cm x 30cm). This gives a total volume of approximately 427-gallons or 1614 liters. 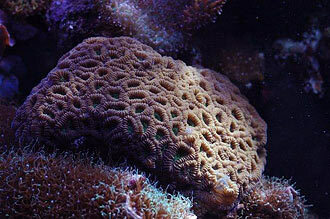 The center overflow is a necessity to enable the reef to be observable from all four sides. I didn’t want the appearance of my aquarium to be overwhelmed by the stand used to support it. This can be problematic for larger tanks that need strong support. 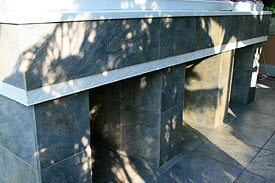 This stand is constructed of four columns, made with mortared cinderblock. These were topped with four steel I-beams. One inch plywood was placed over the I-beams, and a skirt of eight inch poplar boards hides the steel from the sides. Plumbing and electrical pass through the center cinderblock columns and down into the basement. The final effect is that you can see straight through the stand to the other side of the room with no equipment, wiring or plumbing visible. 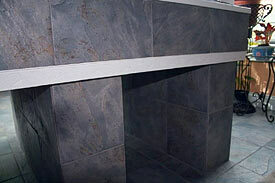 The cinderblocks were then covered with the same tile used for the floor of the room. At first, only the columns were tiled, and I was not satisfied with the final appearance. Eventually I tiled the whole structure. This worked extremely well. It diminished the visual impact of the stand and helped make it appear to be a part of the floor. Wood molding was added for a finishing touch. I built the hanging fixtures from PVC, ordinary lumber and some fancy scrolled wood molding. They are not as unobtrusive as I would like, but I believe I achieved the goal of making them look like a part of the solarium structure. The electrical fixtures that hang from them are two Maristar 2 X 250 watt metal halide, 2 X 39 watt T5s run on Icecap electronic ballasts. I also retrofitted four 24-watt Finnex T5s to the wooden fixtures using gooseneck lamp parts to supplement the light at the tank extremities. The lighting has a lot of flexibility because the Maristars can be raised or lowered, the Finnex T5s can bend any which way, or the entire structure can be rotated left or right. 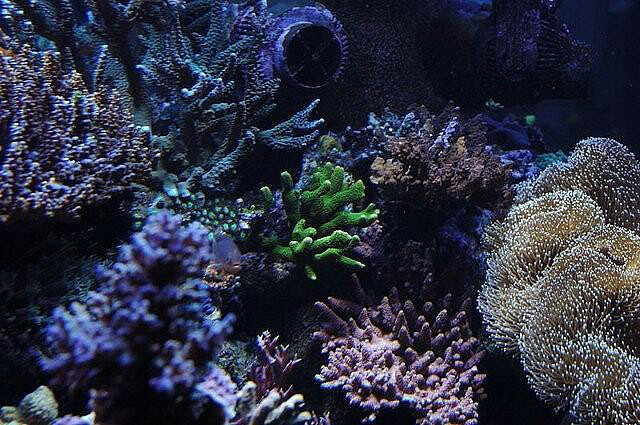 I actually did rotate the lights 45-degrees since the original setup because I found the corals were growing up and inward instead of up and out. The lack of a hood gives me the total access to the inside of the tank that I wanted, plus as it turned out, played an important part in the temperature control of the aquarium. Presently the four 250-watt metal halides are Ushio 250 watt 14K bulbs. The T5s are a mix of ATI Blue Plus and Pro Color. Water Movement: Five Tunze Streams. Two of which are on Waveyseas and all backed up by a UPS converter/charger. Lighting (display): Two Maristar 2 x 250 watt metal halide, 2 X 39 watt T5s run on Icecap electronic ballasts, and four 24-watt Finnex T5s. The four 250-watt metal halides are Ushio 250 watt 14000K bulbs. The T5s are a mix of ATI Blue Plus and Pro Color. Temperature Control: Fans on a Ranco Controller for cooling and two 500-watt heaters for heating. 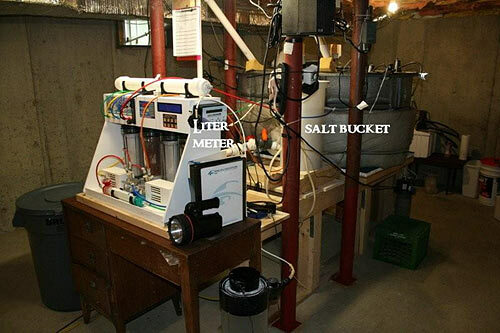 Other Equipment: Dialyseas water change system, an MRC dual chamber calcium reactor converted to run GFO and GAC media, Euro-Reef CS Skimmer used as an ozone reactor. 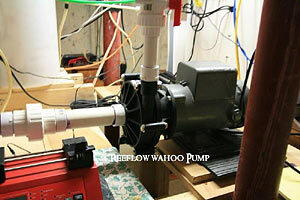 The main pump in the basement is a Wahoo made by Sequence. It was chosen for its electrical efficiency; rather than its output for circulation. 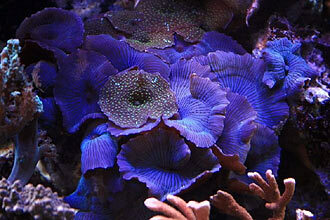 It provides sufficient turnover from tank to sump. 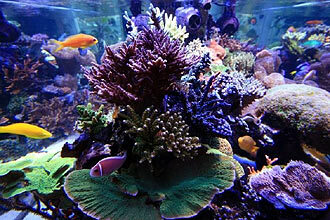 Primary circulation in the aquarium is provided by Tunze Stream Pumps. The decision of whether to use a closed loop or power head configuration was difficult. I don’t particularly like the look of big power heads in an aquarium. However, I also wanted to avoid the power consumption and the inconvenience of maintenance with the closed loop. I decided on power heads because I was concerned I would have difficulty incorporating a closed loop with my stand design and I wanted to save on electrical costs. The power heads also have the benefit of being able to be attached to wave makers (in this case Wavyseas) and are easily serviced. I have five Tunze Streams, two of which are attached to Wavyseas. All are mounted at the top of the overflow. This was a necessary compromise with my “no equipment visible” goal. In case of power outage the Tunze Stream Pumps are connected to a UPS converter /charger that will run them for approximately 13 hours. 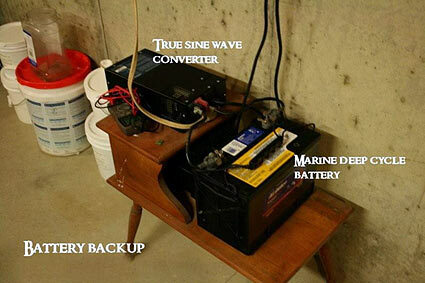 I have a backup generator for prolonged outages. 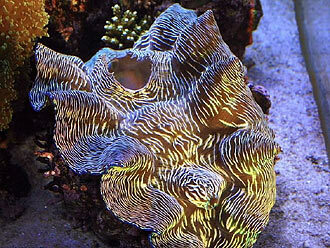 In my long history of reef keeping, I once lost the inhabitants of an entire tank after a hurricane. It was a heartbreaking lesson that I have not forgotten. 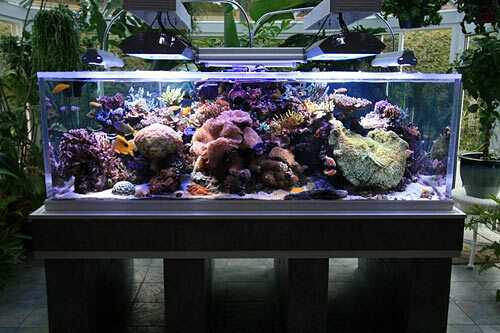 Since this aquarium is so large and I am hopefully keeping it for a very long time, I wanted to find some automated equipment that would help make my maintenance chores easier. 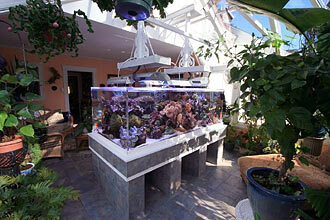 In particular, I wanted something that could automate water changes. 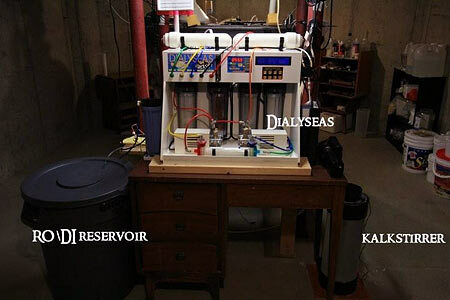 I decided to purchase a Dialyseas made by Seavisions. 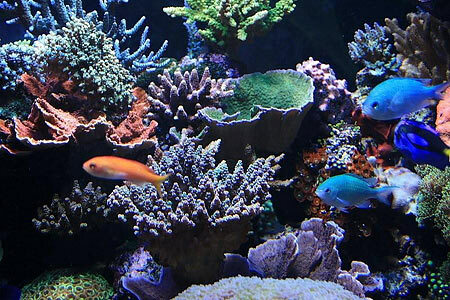 There are other good devices and DIY plans available that can help you to do automated water changes; However, all that I could find require that you make up the seawater yourself. 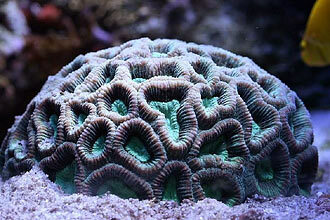 With the Dialyseas, I just pour the salt of my choice into a brine bucket. The machine changes water at a rate that I set. It monitors the water salinity with a conductivity meter and adjusts it accordingly. No mixing, no checking specific gravity or temperature, no draining or dumping water. 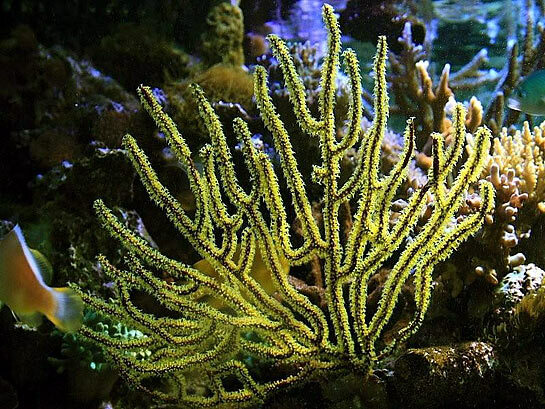 The Dialyseas unit has other features that are found on many of the other controller/monitors available, but it was because of the continuous water change abilities that I purchased it for my system. The sump is constructed of inner and outer parts. The outer sump is a 160 gal Rubbermaid stock tank. Inside this sits another acrylic sump that I bought from Albert Thiel more than a decade ago. A Bubbleking 250 Internal Skimmer and a chemical reactor I converted out of an MRC dual chamber calcium reactor sit inside this inner sump. Water from the aquarium above falls into here first (Tip: Never throw out or sell your old reef stuff). This configuration concentrates the water from above for the skimmer. 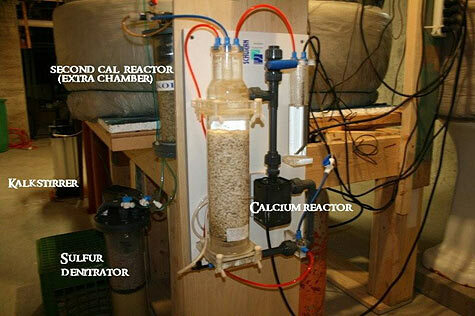 The main chamber of the chemical reactor holds four to five cups of activated carbon and the smaller chamber is used to hold Granular Ferric Oxide (GFO). 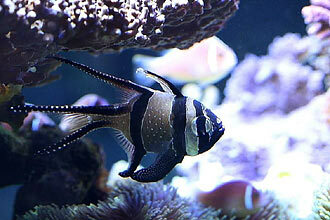 The activated carbon and GFO are changed monthly. 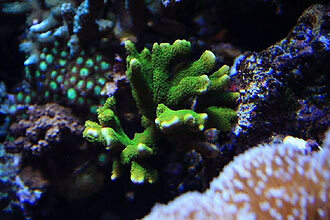 I believe that carbon is essential in a mixed reef and the GFO keeps the phosphates at acceptable levels. After the water passes the skimmer and chemical chambers, it moves on to a remote deep sand bed (RDSB). This is made of a Rubbermaid Brute trash container filled with 16 inches of play sand. 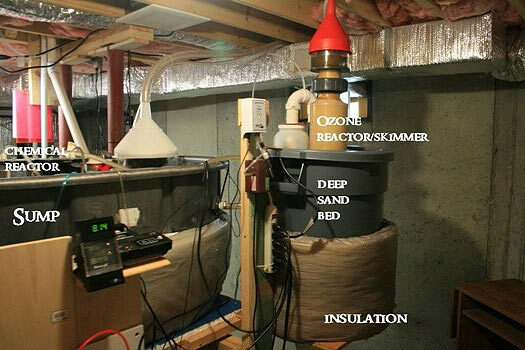 A Euro-Reef CS Skimmer sits on top of the sand bed and is used as an ozone reactor. 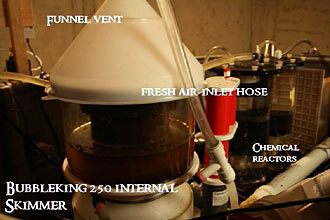 Water that passes out of the ozone reactor/skimmer flows into a DIY carbon chamber and back into the RDSB. The ozone is produced by a Sanders Certizon C200 ozonizer. Subsequently there is a lot of water movement in the RDSB, and this helps keep it clean. 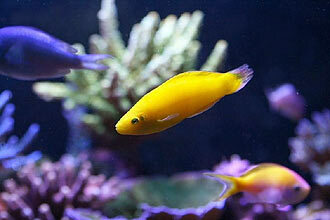 I have found that the animals in the tank look better when I use ozone. I theorize that perhaps the ozone eliminates something the carbon misses. The water from here falls back into the outer sump. This entire process is powered by one Ehiem 1250 Pump that uses only 28-watts. 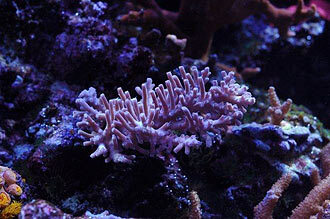 Recently I was experimenting with nightly feedings to keep non-photosynthetic corals. The heavy bioload and nightly feedings were overloading my system and nutrient levels climbed. To help control the elevating nitrate levels I added a sulfur denitrator to my collection of equipment. Nitrate levels have since returned to an acceptable ( < 5.0mg/l ) level. Calcium and alkalinity levels are maintained with the use of a Schuran Jetstream One calcium reactor and an Aquamedic Kalkstirrer. Since the pH of the effluent coming out of the Jetstream is still low, I piggybacked an old Korralin calcium reactor with it to make another chamber. I also made a pair of DIY reactors that are filled with extra media to bring up the effluent pH further. 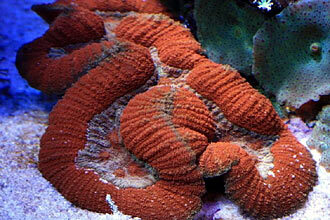 This configuration keeps the calcium >470 ppm and alkalinity at natural sea water levels. 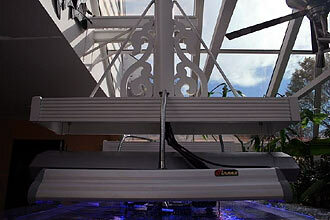 The new construction of the solarium is very airtight in order to save on energy costs. To prevent a problem with humidity in the basement and to help maintain the desired pH of the tank water at normal levels, I devised some modifications. Air from outside is vented in to the skimmers and then back out of the house. The large funnels seen over the tops of the skimmers vent the humid air and/or ozone outside. Fresh air is plumbed into the skimmer venturies. 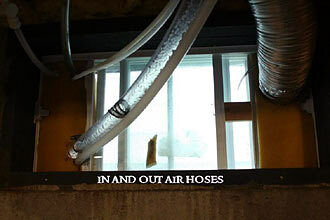 In addition to this, fresh air is also plumbed upstairs through the stand into the durso pipe overflows. 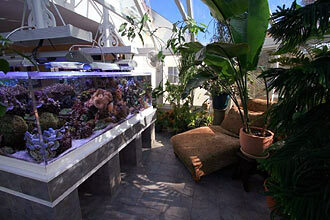 As the water falls from the tank above into the sump in the basement, it is mixed with fresh air from outside. A simple piece of furniture foam inserted into the basement casement window holds all the tubing for the incoming and outgoing air. The funnel modification substantially reduced humidity in the basement and I don’t have to worry about the ozone coming out of the skimmer. The constant influx of fresh air has helped stabilize daily pH swings. To help ventilation further, there is an exhaust fan (made by Panasonic) hanging above the sump. It uses only 11-watts of power and expels 80 cubic feet of air per minute through the casement window. I included iodine with my water parameters because I dose Lugols daily, and as everyone knows, if you add it, you should test for it. 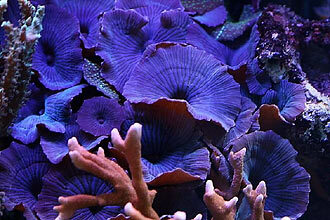 The advantages of iodine supplementation are sometimes debated, but I believe it benefits my soft corals and gorgonians. Test results for nitrate and phosphate fluctuate depending on when in the month I test; therefore I list a range rather than a value. 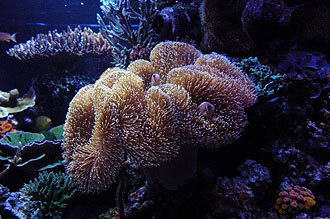 I thought having a reef in a solarium would require special equipment for cooling. This proved not to be necessary. The room is air conditioned, but I keep the room temperature between 78-80 degrees Fahrenheit in the summer because of the high cost of electricity. 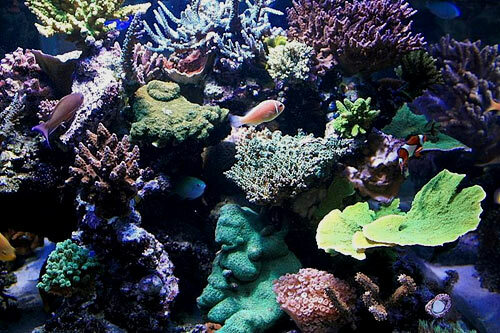 When water temperature reaches 79 degrees Fahrenheit, a Ranco controller in the basement switches a fan on the wall adjacent to the aquarium. The air blowing across the surface of the water keeps the water temperature below 80F. 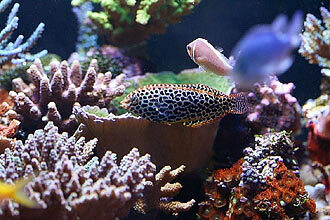 For the winter, there are two 500-watt submersible heaters in the sump. I cover the top of the tank with solid foam insulation at night, again to keep electricity costs down. If I tried to list all the livestock I would never have finished this article. 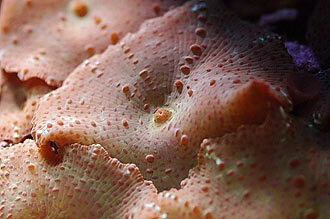 I have a great admiration for those who know their taxonomy and especially to those reefers who can identify their many Small polyped Scleractinian (stoney) coral colonies (SPS). I however would need to consult reference books to accomplish that, so I will summarize. The tank is dosed daily with 6mls of vodka. 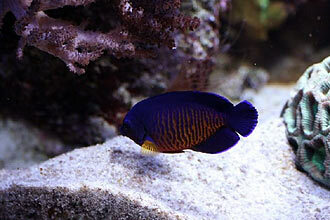 Additionally, 6ml of iron supplement and two drops of Lugols iodine are also added daily. 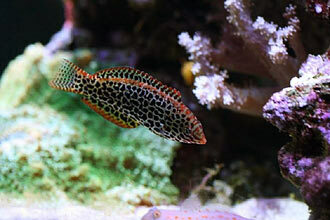 The fish are fed frozen mysis and nori daily. This is supplemented with a variety of other frozen and dry foods. 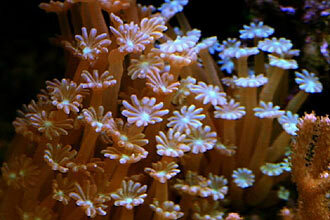 The anemones are rarely fed, every other month or so with shrimp or silversides. 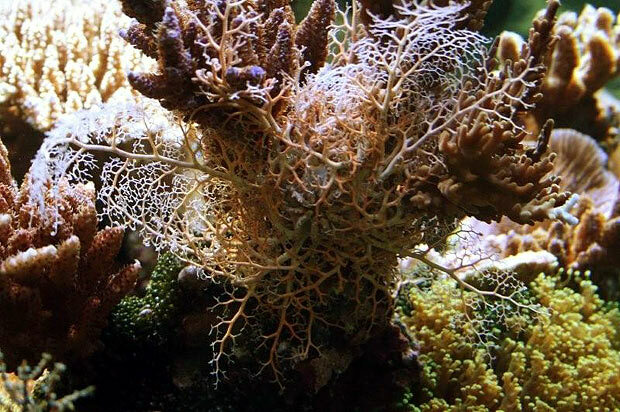 I use a variety of foods of various sizes to feed the gorgonians and the few non-photosynthetic species which is still an ongoing experiment. There are so many people who have helped and encouraged me over the years I would scarcely know where to begin or how to acknowledge them all. 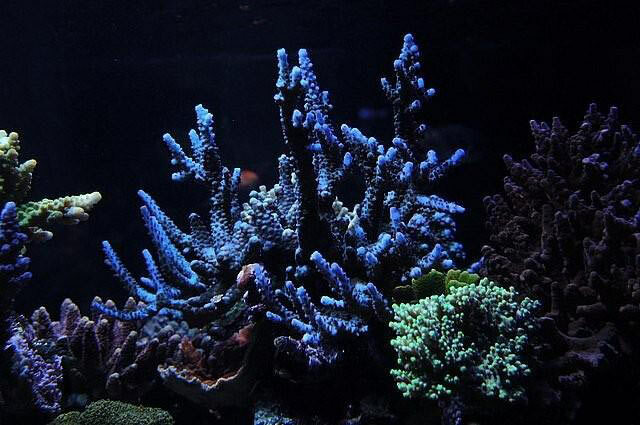 I have been scouring the forums here on Reef Central forever and I would never have accomplished what I have without the shared knowledge from the many people on its forums. 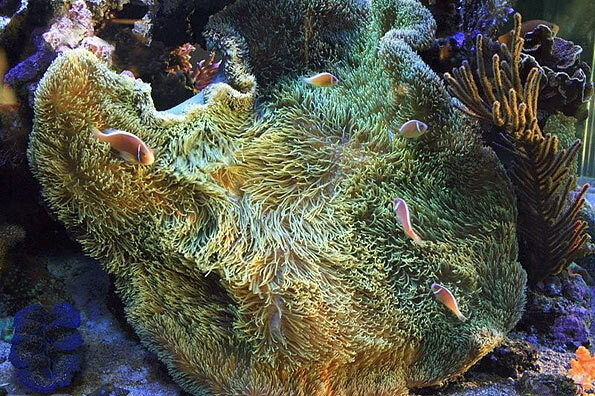 I want to say a special thank you to my friends in the Boston Reefers Society, and especially to Cindy Lebsack who encouraged me to introduce more clownfish to my h. gigantea anemone. 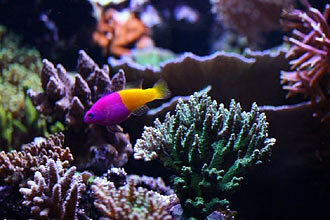 Cindy, (“Flighty” here on Reef Central) gave me six immature pink skunk clowns to add to my breeding pair and their interaction and antics have been a joy to behold ever since. Thank you's to both Greg Thevenin and Chris Helme for their photographic help. 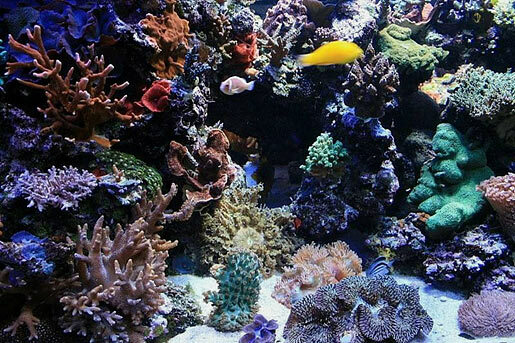 Lastly, I would like to thank the staff at Reefkeeping Magazine who’s hard work helps and inspires so many people to achieve so much with this wonderful hobby.